Both adult and miniature versions of these cutwork coifs have survived from the second half of the sixteenth century. The technique of cutwork was the creation of a delicate structure of needle lace stitches across the spaces cut in a fine linen ground. 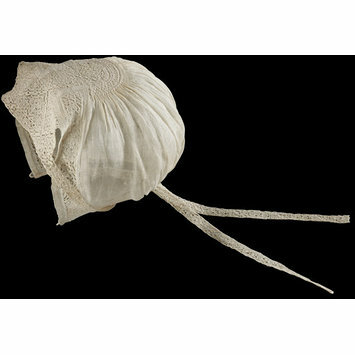 It reached the height of its popularity in the late sixteenth and early seventeeth century, when it was used to decorate every type of linen and in particuar to draw attention to the face and throat in the form of collars and ruffs. In this example, the cutwork has been scaled down to fit the tiny size of the cap, and each square of cutwork is just 1 cm across, the squares separated by three or four of the woven threads overcast with a slightly thicker thread. A few of the picot-decorated bars are worked in buttonhole stitch and the same stitch is used for the solid 'clothwork', although the stitches are spaced so that the light shines through them. Baby's coif, of cutwork and linen. The squares of cutwork are each 3/8 inch (1 cm) across, separated by three or four of the woven threads overcast with a slightly thicker thread. A few of the picot-decorated bars are worked in buttonhole stitch and the same stitch is used for the solid 'clothwork', although the stitches are spaced so that the light shines through them. 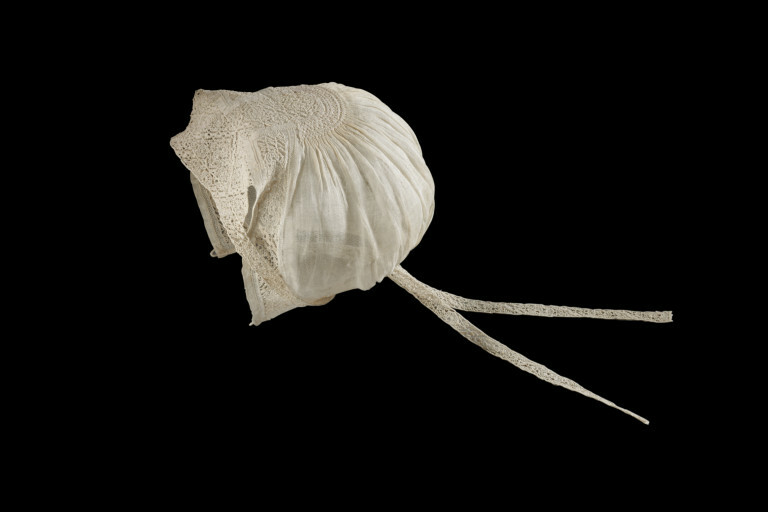 This baby's cap was among a large group of lace purchased by the Museum in 1861. Both adult and miniature versions of these cutwork coifs have survived from the second half of the sixteenth century. One of the best illustrations is the group portrait of Jeanne Riviere, wife of the printer Christopher Plantin, with four of her five daughters, attributed to De Backer, now in Antwerp Cathedral (illustrated in Santina Levey's Lace, A History, plate 35). Jeanne Riviere had a business selling fine linens, and two of her daughters, Martine and Catherine, sold lace in Antwerp. The technique of cutwork was the creation of a delicate structure of needle lace stitches across the spaces cut in a fine linen ground. 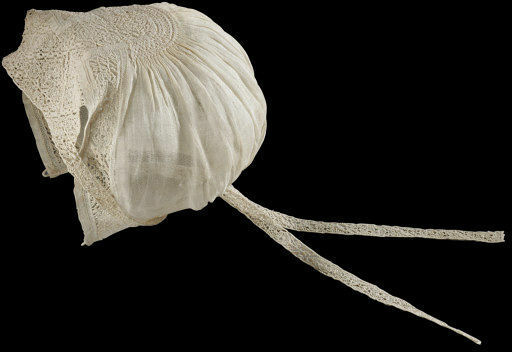 It reached the height of its popularity in the late sixteenth and early seventeeth century, when it was used to decorate every type of linen and in particular to draw attention to the face and throat in the form of collars and ruffs. Baby's coif, cutwork linen, Flanders, second half of 16th century.